Welcome! We have created this learning page to provide you with information about upcoming changes to our Chart of Accounts and Organizational Structure when SkyVU is implemented in January 2018. Please click on the image at right to learn about some of these upcoming changes from Dalana Robertson, Assistant Vice Chancellor and Controller. A chart of accounts is a structure used to record the financial impact of transactions. At Vanderbilt, we use this information to communicate how our transactions support our educational and research mission. Today we use two numbers in our Chart of Accounts - Center Numbers and Account Numbers. However, under SkyVU, our Chart of Accounts will contain nine segments. In the system, you will be able to select the values for each segment from a drop-down list as shown in the image on the left. Please click here to download the Chart of Accounts segment values. Why do we need a new Chart of Accounts? The new Chart of Accounts is being developed as a part of the overall SkyVU implementation. Use of this new multi-segment approach to the Chart of Accounts will enhance the quality of our data and simplify data management, which will improve financial reporting and allow for more efficient analysis. How will the new SkyVU Chart of Accounts compare to our current Chart of Accounts? Our current Chart of Accounts uses two numbers, the Center number and Account number, to convey many different types of information about a transaction. With SkyVU, the Chart of Accounts will have nine distinct segments whose values will each convey a single type of information. When will I receive training for how to use the new Chart of Accounts and Organizational Structure? We will provide training on how to use the Chart of Accounts and Organizational Structure in your work in Fall 2017, prior to the go-live for SkyVU on Jan. 1, 2018. In the meantime, we will continue to provide information about the development of this structure through the SkyVU website, blog and other communications. How will I know which values to choose from the drop-down lists when I use the Chart of Accounts? For the Mandatory segments (Entity, Net Asset Class, Financial Unit and Account), the values and descriptions will be established centrally and displayed within the application. The tool also includes a search option for each segment, eliminating the need for external searches as typically required today. The Optional segments (Program and Activity) have been provided for each area to track financial transactions for its unique programs and/or activities perform reporting as needed. Each area will determine their own use of these segments, and only generic values and descriptions will be listed within the Chart of Accounts. Leaders in each area will communicate how these generic values will be used. You will not need to enter any values in the System-Generated segments (InterEntity, Future 1 and Future 2), as the system will populate these fields automatically. Click here to view a PDF of all Q&A items. The Entity segment indicates the unit that owns our assets, such as buildings and equipment, our liabilities, such as accounts payable, and our net assets. Net Asset Class indicates both the use of the funds and the level of restriction for assets in our financial statements (i.e., unrestricted, temporarily restricted or permanently restricted). This designation is primarily used to meet our accounting and financial reporting requirements. As a result, you may see assets with an “unrestricted” net asset class from an accounting perspective even though the funds are designated for a specific use within a particular school or department. A Financial Unit is an area whose activities generate revenues, incur expenses or both. The Financial Unit segment in the Chart of Accounts will correspond with the Work Units used in our Organizational Structure. The Account segment identifies the type of asset, liability, net asset, revenue or expense included in the transaction. The Program segment may be used to report on a set of related activities for a specific purpose. Programs are typically long-standing initiatives and may involve one or more areas within Vanderbilt. The use of the Program field will be determined at a local level, and thus leaders in each area will provide additional information for its use. The system will assign a Default Program value automatically. Generic values and descriptions (e.g., Program 001, Program 002) are provided to allow for flexibility of use by each area. The Activity segment may be used to report on a specific event or activity. Activities may involve one or more areas within Vanderbilt. The use of the Activity field will be determined at a local level, and thus leaders in each area will provide additional information for its use. The system will assign a Default Activity value automatically and provide options for institution-wide activities (e.g., Recruiting and Compliance) that may be selected as determined in that particular area. Generic values and descriptions (e.g., Activity 001, Activity 002) are also provided to allow for flexibility of use by each area. The InterEntity field will be assigned automatically by the system whenever a transaction occurs between two or more Entity segment values. The system will populate the appropriate value from the Entity segment when such a transaction occurs. 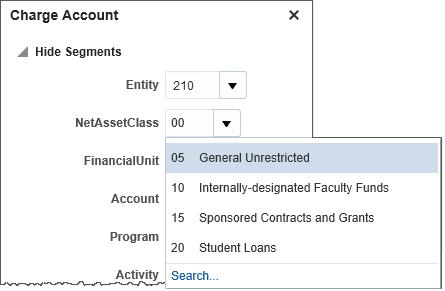 For example, if Finance were to place a catering order with Campus Dining, then the system would automatically create an entry using the InterEntity segment, because both Finance and Campus Dining are Entities in the Chart of Accounts. 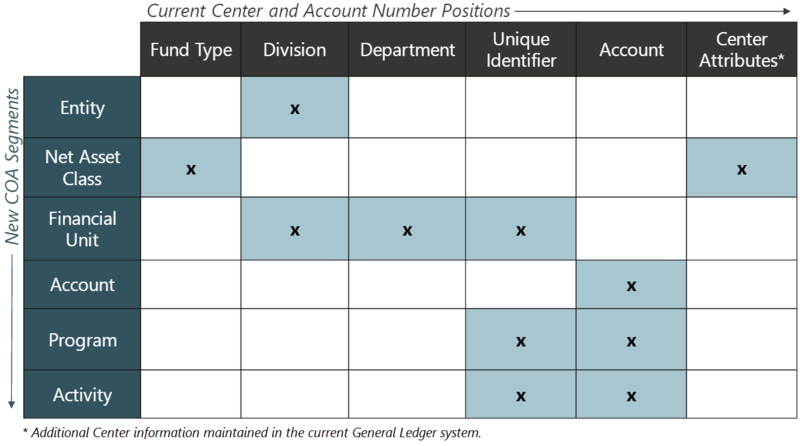 These segments have been created to allow for future expansion of the Chart of Accounts. They will not be used currently, and the system will automatically assign a default value of zero.